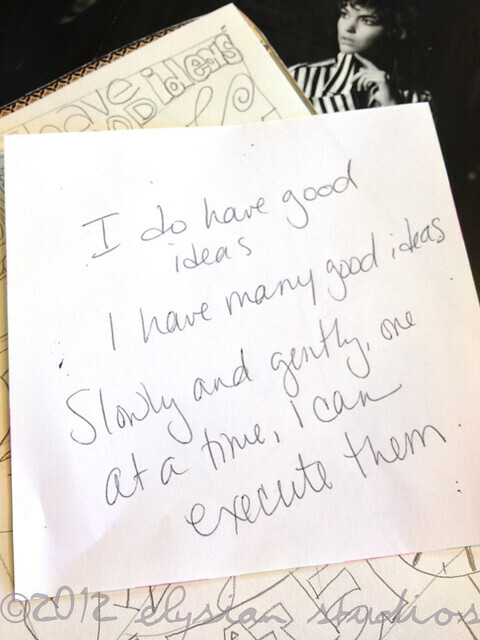 I am always looking for ways to stretch my creativity. My goal is to be constantly in the creative flow. That doesn't mean completing a masterpiece everyday. It means discovering how to free up my mind and my hands in my down-time, so I can find ideas I didn't know I had, improve my technical skills, and motivate myself to keep going. I've recently discovered the joy of Zentangles, which is a simple method of drawing repetitive patterns. 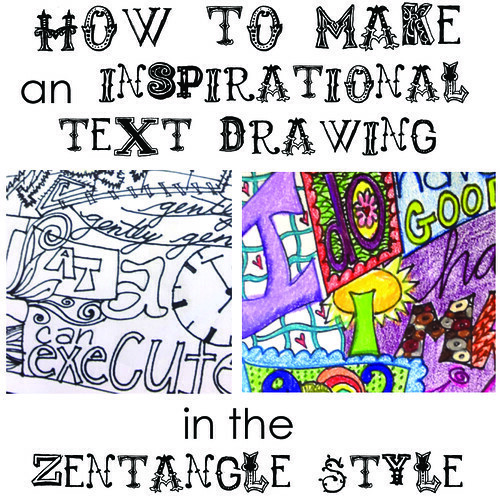 If you've never created one, here's a great introductory Zentangle video. There's really a million ways you can create your own variations of this idea. What better way to memorize it, than to draw it? 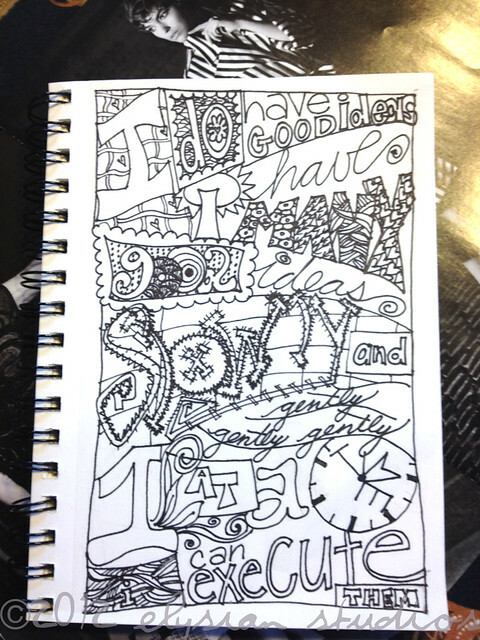 And what more fun way to draw it than in the relaxing, improvisational style of Zentangle? Begin by drawing with your pencil. First, create a rectangular border for your quote. Then divide your rectangle into sections. I divided mine into about seven "swooped" sections. Fill in these sections with the words from your quote, and try to mix up the style in which you write: script, block letters, boxed-in letters, etc. Try out some new things! Once you are happy with your arrangement, go over your final layout with the pen. You are done with the pencil, so you can erase some visible lines if you'd like, but now it's time to go confidently forward with permanent pen! When your layout has been inked, start to go back into the sections and fill them in with patterns. If you are stuck, check out TanglePatterns.com for some fresh ideas. The first time you try this technique, you might be low on pattern ideas, but once you start trying some new patterns, you will easily remember them for future drawings! Don't forget to leave a little blank space around your drawing. It's nice to have a resting place. Ultimately, however, this is your drawing, and it's really about the act of making it more than it is about the final product. After you've finished inking all of your patterns, it is time to start coloring! Break out whatever looks fun to work with, just make sure the paper you have chosen will support the materials you are using (typing paper won't hold watercolors well!) I have been using a different medium each time I do one of these. Here, I used my Prismacolor pencils. Color, color and color to your heart's content! Remember how fun it was to take the time to do this when you were a child? Enjoy it! 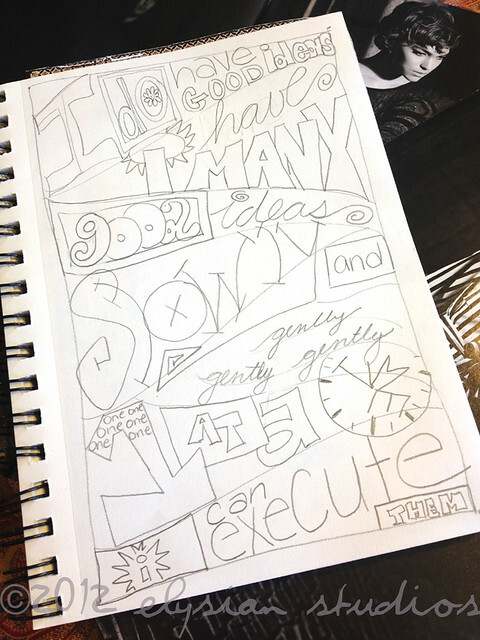 When you are finished, you'll have a beautiful Zentangle-style drawing of a favorite quote, and you will have spent a lot of healthy time soaking up that positive thought! 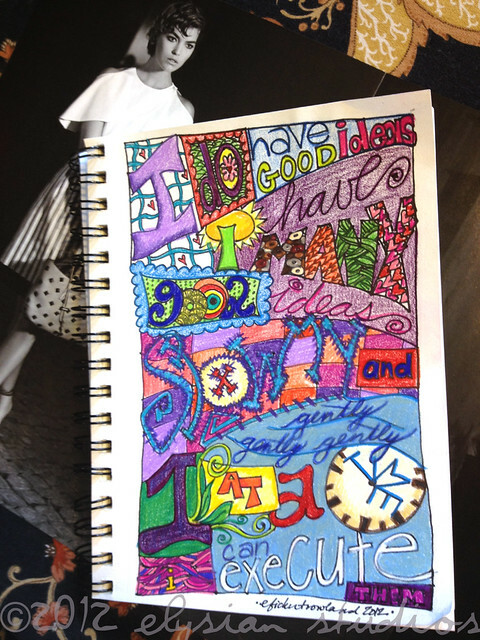 Have you ever tried Zentangles? If you enjoyed this post, you may also like my Zentangle Watercolor tutorial! I have never tried them and am very intimidated with drawing but I doodled all through high school and college as I took notes during class. So it may be time to tap into that young doodler again. I will definitely be trying this! Yours is so cool & I love the quote!!! Great Post Erin!!! Yes! 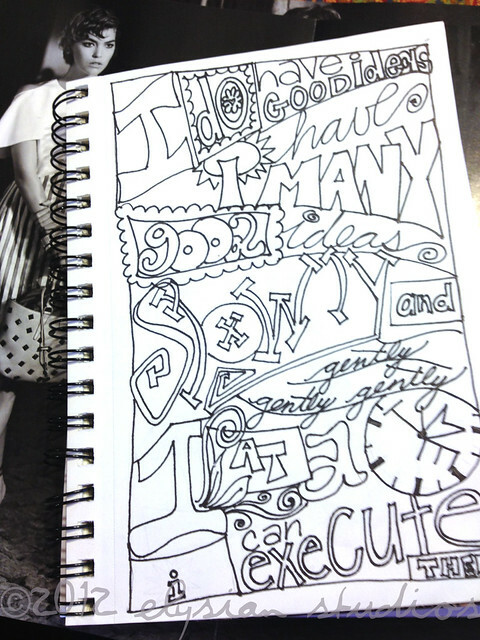 I have played with zentangles! But NEVER quite in this way! I love how this evolved and the use of color and patterns. An sending a link to my zentangle buddies! Thanks for that, Pam! And, Christine, I also doodled whenever I took notes. I have lost my touch in all these years, but think this is a great way to get those doodle skills back. Thank you both for your comments! I have played with zentangles a little too. Zentangling a meaningful quote would seem to me a great way to practice those doodling skills and, at the same time, stay in a positive frame of mind. Great stuff! Yes I zentangle too, I find it a very relaxing way of creating something. I never thought of using it for lettering though, it's a great idea! Will surely try it out. Thank you Thank you, I love Zentangles and lettering and have been looking for some easy but awesome lettering to use with tangles in my art jounal. Love this! Great! I am so happy you all were inspired by this idea! Thanks for sharing! 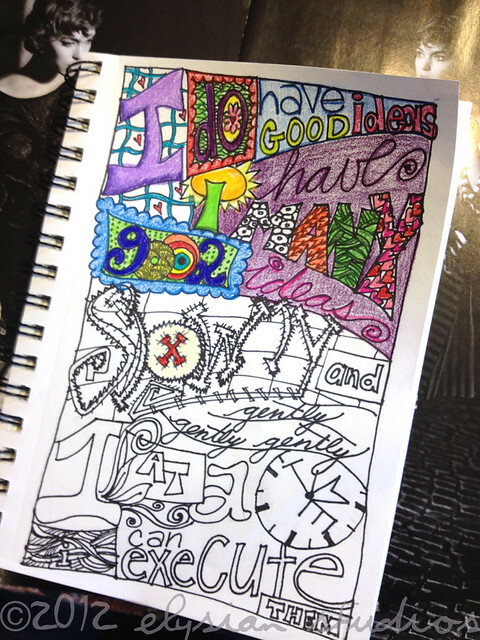 I teach middle school and was looking for an introductory project for 6th grade art club to use in art journals donated to the class.My students love doing Zentangles. What a fabulous idea!!! I just stumbled across this post, thank you so much! LOve your site and your creative side. Yes I to love Zentangles and can't seem to get enough of them. I do all types of designs, but not in lettering. Will have to see what I can come up with. Thank you sooo much for this. Very inspiring!!! I am going to doodle tonight. I am a substitute teacher in elementary art and teaching for the next 6 weeks....my fourth graders are going to this!! Love this idea. I have been zentangling for a while, and I'm inspired to try this twist. Thank you. love the idea. will try it..